Broken capillaries, capillary hemangiomas (also called cherry hemangiomas), red vessels at the corners of the nose, and the flushing redness of rosacea are the most common examples. Nasal veins are by far the most common example of blue skin lesions that IPL can treat successfully. Sun spots, sun damage, and naturally occurring, long-standing, and unchanging freckles can be treated with IPL, and our signature treatment for these issues, The Sun Spot Series™, is the best way to treat them. Dark spots or patches that are not from sun exposure (hyper pigmentation), and freckles that are new or changing in appearance should never be treated with IPL, they should be examined by a physician. What skin problems should NOT be treated with IPL? Melasma. Melasma is a disorder of pigmentation in the deep layers of the skin that classically occurs for the first time in young women (20’s and 30’s) who are either pregnant or on birth control, which is why it is known as the “mask of pregnancy”. Dark patches appear on the cheeks, nose, and upper lip, and may severely worsen with sun exposure. Melasma can sometimes be difficult to distinguish from sun damage, so it is critically important to have a skin care consultation with a physician who is qualified to make the correct diagnosis. Treating melasma with IPL may lead to a worsening of the condition, much like sun exposure. Click here to learn more about treating melasma. Hyperpigmentation. Any dark spots or patches that are not due to sun exposure, or those that are found in dark skinned people, should not be treated with IPL. True hyper pigmentation has a variety of causes (eczema, surgical or burn scarring, acne scarring, melasma, just to name a few), none of which are appropriately treated with IPL. Click here to learn more about treating hyper pigmentation. Surgical or burn scars. Scars of all kinds will respond better to deep penetrating resurfacing lasers than they will to IPL. Click here to learn more about laser scar treatments. Moles or any unknown skin lesion. Any mole that is new, larger than normal, darker than normal, multi-colored, irregular, painful, itchy, or changing in appearance should never be treated with a laser of any kind. It should be examined by a physician as soon as possible. Hair Removal. IPL is often sold as a laser hair removal treatment at medi-spas and physician offices with inexperienced practitioners performing the treatments. Almost any laser will burn away fine hairs if the setting are high enough, this does not mean that the laser is an appropriate choice for laser hair removal. Hair removal requires a specific laser wavelength to be effective and safe, and IPL is not it. Furthermore, using IPL in an attempt to remove hair, especially on the body, can result in severe burns and/or permanent scarring, so make sure you are being treated by a physician who is experience with laser skin care like Dr. Vendemia. Skin Texture Problems. Textural issues like large pores, acne scars, and wrinkles will not be adequately treated with IPL. Click here to learn more about improving skin texture with fractional laser resurfacing. IPL uses specific wavelengths of light in pulses of differing intensities that target melanin in sun spots and tanned skin, as well as hemoglobin in vascular lesions like broken capillaries, rosacea, and nasal vessels. The absorbed light causes just enough damage to these cells that the body will generate a healing response that results in the spot being resorbed by the body. Freckles and sun spots will darken temporarily after the treatment (the darkening is a sign of adequate light absorption), and then slowly lighten or flake off after a few days to a few weeks. Broken capillaries can sometimes disappear after a single treatment if enough light is absorbed, but will usually require a few treatments to completely collapse the offending vessel. What Is Different about IPL Treatments at MAS? Here at MAS, we believe in the power of good technology, and we pride ourselves in being knowledgeable about the newest and most effective devices. 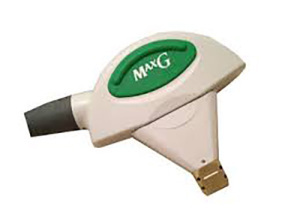 IPL is essentially the older version of this technology. The newer, more effective version is called OPL, which stands for Optimized Pulsed Light. The biggest difference between OPL and IPL is that OPL targets pigments and hemoglobin much more specifically than IPL which minimizes the damage to the normal surrounding skin, and therefore also minimizes the downtime and risk of undesirable pigmentation changes in the normal skin. OPL is also capable of delivering higher energy pulses into pigments and vessels because it is more target specific, and this higher energy delivery can often translate into fewer treatments. This is not to say that IPL has no role in modern laser skin care, because it does. Dr. Vendemia still uses IPL for cosmetic laser skin treatments like IPL Photofacials, and The LiteTouch Laser Facial™, as well as for certain skin types that may not be able to handle OPL. Are you considering IPL treatments in New York? We offer the most innovative technologies and the quickest recovery times, and all treatments are performed by a physician for added safety and comfort. Please feel free to contact us online or call our office at917-703-7069. How is a real IPL or OPL treatment different from a Photofacial? A true IPL or OPL treatment requires an experienced physician who knows how to match the intensity and duration of the light pulse to the specific color of the pigment, or to the size of a specific blood vessel. The most experienced practitioners will treat each spot individually with customized settings and equipment targeted towards the melanin level or vessel size. This is not to be confused with a “photo facial” that also uses an IPL machine, but is no where near as specialized in terms of the attention to detail, the customization of the settings and equipment, or in the level of knowledge required of the practitioner. A photo facial is a non-customized blanket treatment of the skin with pulsed light that may result in some improvement of the least troublesome pigments, but will not clear the skin in the same way that true IPL treatments will. Photofacials are excellent maintenance treatments, and should be performed regularly 3-4 times per year to keep sun damage to a minimum, but this kind of maintenance routine should only be undertaken after the amount of sun damage, broken capillaries, and freckles has been reduced to a minimum with a series of 3-5 real IPL or OPL treatments. Most patients with freckles or sun damage will notice an improvement in 2-3 sessions, but some people with very dark freckles, very fair skin, or advanced sun damage, may need 3-5 treatments for the best result. Broken capillaries can often vanish after a single treatment, but you should plan for 2-3 follow up treatments to ensure that the vessel stays closed permanently. Patients with rosacea will need at least three treatments, but should be prepared for 4-6 sessions for an optimal result. What Is the Downtime with IPL Treatments? There is no real down time after an IPL treatment. Your skin will be slightly pink and a bit sensitive, but you can immediately apply makeup and go about your day. The majority of the pinkness and sensitivity will dissipate within a few hours after the treatment. Sun spots and freckles may darken considerably after the treatment (which is a desired sign of adequate light absorption), but can still be covered with a drop of concealer. This darkening is totally normal and expected, and is one of the best ways to know that the melanin cells have been treated properly. The darkened spots will begin to flake or fade after a few days, and will continue to fade over the following 2-3 weeks. Many of our patients will choose to have a session of Macrodermabrasion™ 3-4 days after each IPL treatment to speed up the flaking process for the darker freckles. Is it harder to treat lighter pigments or darker pigments? Believe it or not, it is much harder to treat light pigments on very fair skinned individuals. Darker pigments absorb the pulsed light better than lighter pigments, just as a black car absorbs the sunlight better than a white car. Therefore, light colored pigments on lighter skin tones usually require more frequent and more intense treatments with the most advanced forms of this technology, preferably OPL. Yes, sun damage will occur any time you go in the sun. IPL treatments only treat sun damage that is present at the time of the treatment, they do not prevent future sun damage from occurring. Only sunscreen and sun protective clothing can do that. Can I have IPL treatments if I have a tan? No, you should not have IPL or OPL treatments if your skin is tan. A tan is essentially a blanket form of sun damage, which is exactly the same pigmentation change that IPL will treat. IPL treatments performed on tan skin will result in patchy, visible, treatment spots, so it is always best to wait until your skin is back to it’s natural color before having IPL, OPL, or a Photofacial. For more information about IPL or OPL for sun spots, freckles, and broken capillaries, please contact us online to schedule a consultation or call our office at 917-703-7069. If you haven’t already done so, check out the amazing results in our Before & After photo gallery by clicking on the image below. We’re looking forward to meeting you! Dr. Nicholas Vendemia performs IPL and OPL treatments for women and men in the New York metro area. We encourage you to contact us online or give Manhattan Aesthetic Surgery a call at 917-703-7069 to schedule a visit. 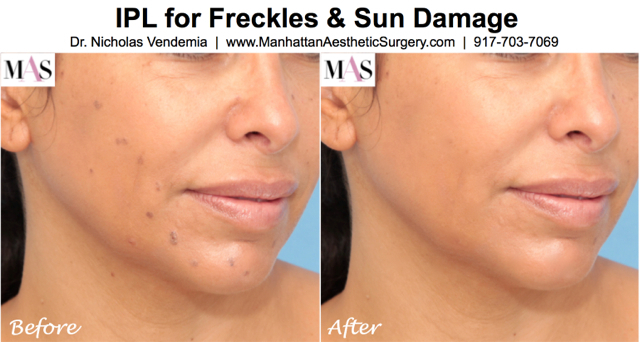 Dr. Vendemia is a leading cosmetic surgeon in New York City with a reputation for custom care and beautiful results.